"As with previous editions, the authors have produced a leading textbook on regression." Introduction to Linear Regression Analysis, Fifth Edition continues to present both the conventional and less common uses of linear regression in today’s cutting-edge scientific research. The authors blend both theory and application to equip readers with an understanding of the basic principles needed to apply regression model-building techniques in various fields of study, including engineering, management, and the health sciences. Examples of current uses of simple linear regression models and the use of multiple regression models for understanding patient satisfaction data. In addition to Minitab, SAS, and S-PLUS, the authors have incorporated JMP and the freely available R software to illustrate the discussed techniques and procedures in this new edition. Numerous exercises have been added throughout, allowing readers to test their understanding of the material. 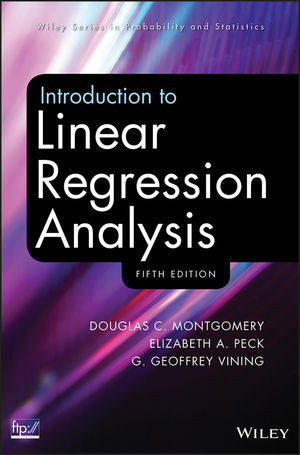 Introduction to Linear Regression Analysis, Fifth Edition is an excellent book for statistics and engineering courses on regression at the upper-undergraduate and graduate levels. The book also serves as a valuable, robust resource for professionals in the fields of engineering, life and biological sciences, and the social sciences. DOUGLAS C. MONTGOMERY, PHD, is Regents Professor of Industrial Engineering and Statistics at Arizona State University. Dr. Montgomery is a Fellow of the American Statistical Association, the American Society for Quality, the Royal Statistical Society, and the Institute of Industrial Engineers and has more than thirty years of academic and consulting experience. He has devoted his research to engineering statistics, specifically the design and analysis of experiments, statistical methods for process monitoring and optimization, and the analysis of time-oriented data. Dr. Montgomery is the coauthor of Generalized Linear Models: With Applications in Engineering and the Sciences, Second Edition and Introduction to Time Series Analysis and Forecasting, both published by Wiley. ELIZABETH A. PECK, PHD, is Logistics Modeling Specialist at the Coca-Cola Company in Atlanta, Georgia. G. GEOFFREY VINING, PHD, is Professor in the Department of Statistics at Virginia Polytechnic and State University. He has published extensively in his areas of research interest, which include experimental design and analysis for quality improvement, response surface methodology, and statistical process control. A Fellow of the American Statistical Association and the American Society for Quality, Dr. Vining is the coauthor of Generalized Linear Models: With Applications in Engineering and the Sciences, Second Edition (Wiley).